When I made my list of films from the 1001 List that I’m Most looking forward to, this was one I was a little apprehensive of, but looked forward to nonetheless. 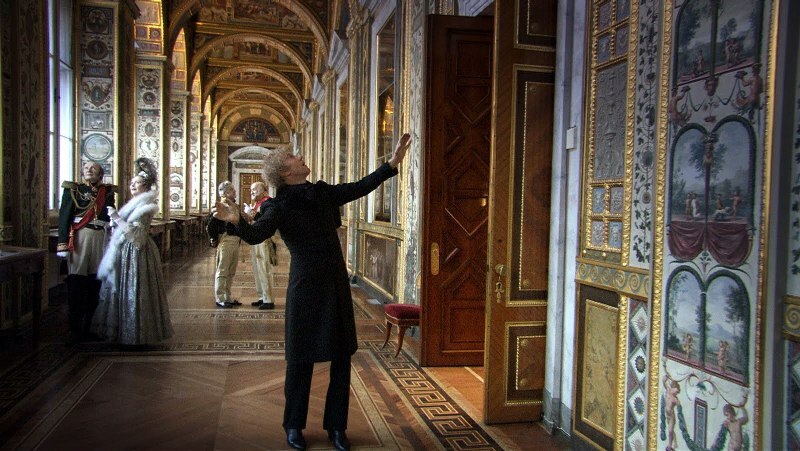 You see, I knew Russian Ark was filmed as one long steadicam shot – a filming technique I’m fascinated with and always impressed by – but I didn’t know a great deal more about it, other than it somehow featured Russian History in some way. History isn’t my strong suit, especially not Russian (Alexander Nevsky proved that), and once again I felt I was missing out on a great deal, simply because I’ve never cracked open a book on the lineage of the Tsars. There isn’t a great deal of plot on display here, at least not much of one I could comprehend. 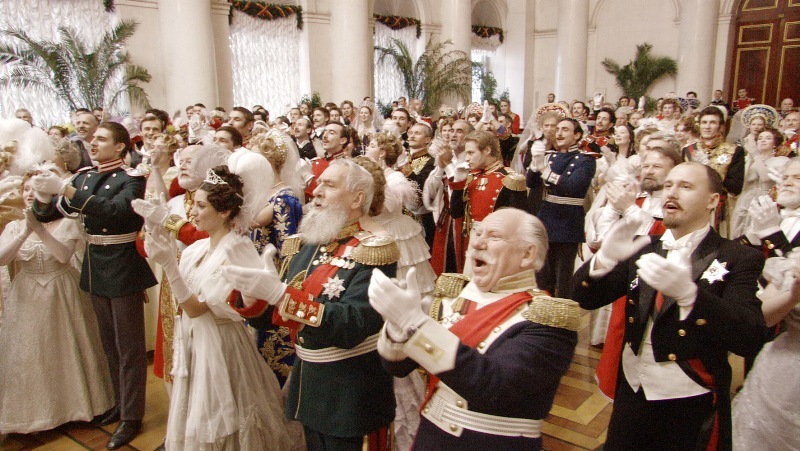 It appears that our narrator (director Aleksandr Sokurov), whose first-person-viewpoint is all we see throughout the film, has somehow arrived outside of a lavish house during a party. He meets a mysterious stranger known as The European (Sergey Dreyden) who acts as his guide as he makes his way into, through and out of the house. As they move from room to room, they pass into different eras and significant moments in history, as well as encountering present day tourists viewing the museum/art gallery. Along the way, some of the people they come across seem to be able to see and interact with our leads, whereas others are oblivious to their presence. I wasn’t really a fan of this film. The single tracking aspect is very impressive and well done, although there aren’t any technically ambitious shots, a la Children of Men (where my appreciation for this technique began). It’s a lot of walking around, staying at eye level. This is fine, more than acceptable, especially when you consider that this film involves something in the region of 2,000 people appearing on screen, as well as three fully functioning orchestras. Apparently this was successfully achieved on the third take, which was just as well as due to time constraints there wouldn’t have been an opportunity for a fourth attempt. There are several instances where I think a redo could have been asked for – several extras and some of the main actors are prone to glancing at the camera from time to time – and the audio was clearly recorded afterwards, presumably to cover up a few fluffed lines here and there. Speaking of the dialogue, it was at times difficult to ascertain who was speaking at what time. Characters often talk over one another – I’ve seen some Robert Altman movies, so this is not that strange to me – but when the dialogue is subtitled, and spoken by actors who either sound similar or own voices I’m unfamiliar with, it becomes almost impossible to distinguish out which lines belong to which characters. I think my main issue with the film is that the shooting style doesn’t actually match the film itself. Recent films like Silent House, which used a similar technique, are more suitable, as the one-shot method heightens the tension. Elsewhere, a film that happens in real time, predominantly following one character would suit this too – like Hitchcock’s Rope, for instance – but here time doesn’t appear to be a factor, as moving from room to room effectively changes time periods and locations anyway. What I’m saying is, here the one-shot method is simply a gimmick that adds nothing to the film other than a pretty damn thick layer of difficulty in achieving the final result. Granted, it means the film is still discussed today, but without the technique I don’t think I’d ever have heard of it. It’s also – unless I missed something – never spelled out as to what it is we’re really watching. My initial thought, and one I retained throughout, is that our protagonist – if one can have a protagonist without a plot – has recently died, and is now journeying to the afterlife, or potentially experiencing the afterlife, which for him for some reason takes place in a stately house full of figures from Russian history as well as people he recognises visiting a museum. There are a few moments that seem weird purely by those standards too, such as the slow-motion raspberry blowing between the European and a guard who acts as security in the house, and follows our heroes for a while, keeping an eye on them. This is one of those films that I longed to end, as after the first hour of incomprehension it really felt like a chore. The intolerably long dance sequence did nothing to help this, nor did the minute-long standing ovation and applause given to the conductor and musicians afterwards, which was followed by the camera queuing up to slowly leave the building among a huge throng of people. This is annoying enough when it happens to me in real life, but I truly felt a sense of impatience at these people being in his way, because I just wanted him to get out of the house so the film could end. Any points I award it are purely for the technical achievement, which should not be understated, as well as the costuming and make-up work, which is astounding given how many people had to be dealt with. This entry was posted in 04/10, 1001, Choose Life, Empire Top 500, Review, The List and tagged Aleksandr Sokurov, Russian Ark, Sergey Dreyden by jaycluitt. Bookmark the permalink. I was excited to see this for the first time, and it’s one I’d watch again, but only for the technical prowess on display. It’s visually impressive. Unfortunately, it’s only visually impressive. There’s nothing else there except for the fun of trying to figure out how it was done. It’s candy, meaning it’s tasty in that way, but also insubstantial and ultimately unsatisfying. I agree that it’s only worth watching for being technically impressive, but other than the scale of the single shot on display it didn’t actually impress me enough to go back and work out how it was done. I don’t mean to belittle the project, but as far as single shots go it seemed fairly straightforward by way of just following the guy walking along. I didn’t spot anything and say “I wonder how they did that.” Maybe I missed some bits when I started getting bored and looking around the room to somehow increase the rate of time passing. I’m with Steve in that I liked watching this for the sheer coordination of having several hundred extras all appearing where and when they needed to be. I also enjoyed seeing The Hermitage musuem, which was beautiful. I also agree that there’s little to no plot, other than exploring various periods of Russian history. And despite that the 1,001 Movies book claims, this was not the first film to be a single shot. Timecode beat them to it and it featured FOUR simultaneous shots in four quadrants with actors occasionally interacting with ones from the other quadrant, so we saw the same scene from two angles. It included scenes such as an earthquake coordinated among four different locations around Los Angeles, including one being inside of a limousine that was driving to L.A. from a house really out in the valley where the scene had started. I’ve only had a quick glance, but I couldn’t find a way of adding a captcha. I’ll look into it, but I’ve heard from others that they refuse to leave comments anywhere with such a device. I’ve heard of Timecode, and the premise intrigues me. I intend to get to it some day, but alas it’s not on any lists, so it takes a backseat priority-wise. I think this is a film to see in the theaters. I’m with you on knowing very little about the history of Russia. Seeing it on the big screen induced sort of a dream-like quality of gliding through the museum that even a solid home theater experience can’t match. It’s interesting that Chip mentioned Time Code, which I also was impressed by in the theater. At home, not so much. The theatre probably would have made me pay a bit more attention (I have a tendency to look around or check my phone at home when the film gets boring, as this one did). However, were it playing in a theatre near me I wouldn’t pay to see it. I may not even go if it was free, other than if I needed somewhere to nap, as I can guarantee I’d be asleep within minutes.